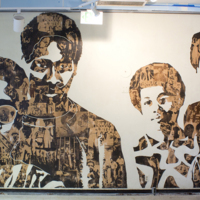 In 1970, a group of seven black UCLA art students created a mural titled The Black Experience on the first floor of the Ackerman Student Union building. 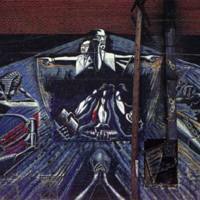 The mural, which measures 10 feet by 27 feet, was obscured for 20 years by a false wall erected in front of it during building renovations in 1992. Then in 2013, the mural was restored. “It was important in 1970, as it is today, to address issues of racial disparity on the UCLA campus,” one of the artists, Helen Singleton said. 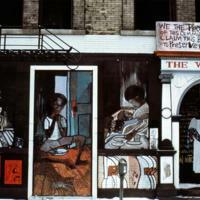 “Our mission in creating ‘The Black Experience’ mural was to expand and enhance that effort with a visual representation of the history and experience of African Americans in the United States.” The seven art students, Helen Singleton, Marian Brown, Neville Garrick, Andrea Hill, Jane Staulz, Joanne Stewart and Michael Taylor, are all depicted in the mural, alongside silk-screened graphics of the antislavery leaders Frederick Douglass and Harriet Tubman, alongside Martin Luther King Jr., Malcolm X, Bobby Seale, Huey P. Newton, Muhammad Ali, and Angela Davis. “We learned a lot about our history by exploring what images to use,” said Garrick, who was a freshman from Jamaica when he participated in the art project. 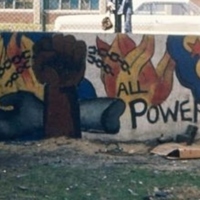 In 2012, the effort to uncover the mural gained momentum after members of the Afrikan Student Union brought the mural to the attention of the Associated Students UCLA board of directors. At the unveiling in 2013, both Singleton and Garrick were guests of honour, along with activist Angela Davis. 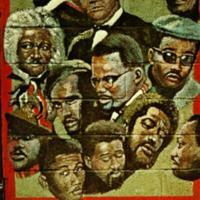 In 1970, Eugene Eda Wade painted the Wall of Meditation on the exterior façade of the Olivet Community Center. Malcolm X and Martin Luther King Jr. anchor the middle of the mural, and are surrounded by Egyptian figures on the left, and enslaved figures breaking free from their chains on the right.